In Patagonia, Scarlett, Stalker, and the rest of Bravo Team are being pursued by Cobra forces. Meanwhile, Duke tries to scramble a rescue team, but they're crippled by the severe budget cuts. It seems very ironic that while Chuck Dixon's Snake Eyes has never been better, his G.I. Joe series has never felt so weak. This is the third chapter of the "Deep Terror" story arc, and I am no closer to understanding what is going on in the story, and so I am no closer to being interested in it. Cobra (or at least Mindbender) is mining for some mysterious material in Patagonia, and three issues later we still don't know what that is. Scarlett and her team are there for covert intelligence gathering, although the heavy muscle of Bravo both contradicts that and ends up being too convenient for me to genuinely concerned about what happens to them. There is no tension in this book; the amount of plot holes and coincidences has deflated that. The story would be stronger if the plot moved more quickly, but if anything, it seems to be slowing down. At the beginning of this issue, Scarlett is held captive by Vipers in Cobra's base. At the end of this issue, Scarlett is about to be taken captive by Vipers in Cobra's base. At the beginning of this issue, the men from Bravo team are escaping Cobra forces in tunnels leading out of the mines. 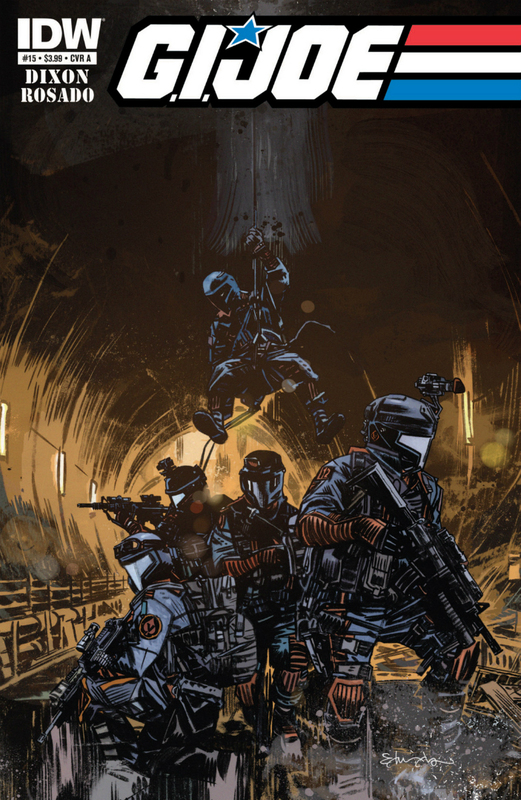 At the end of this issue, the men from Bravo team are escaping Cobra forces in tunnels leading out of the mines. The premise of this plot is pretty weak from the start, and the reader isn't getting much back as the story progresses. "Deep Terror" has all but lost my interest. One of the few significant events that happened in this issue was the kiss between Scarlett and Mainframe. Dixon's been building up this relationship (albeit one-sidedly) for a while. I couldn't be more disappointed. I rather liked Dixon's version of Mainframe when he was first introduced; a genius who was the first in the world to see and recognize Cobra for what it was. But lately, Dixon's reduced Mainframe to a one-note character: a smart guy with a huge crush on Scarlett. In a recent interview with Comic Book Resources, Dixon made a comment that although boys don't want to admit it, it is the relationships in books like Spider-Man that brings the readers back every month. I couldn't disagree more. While we do like to see Parker go on (and mess up) dates, the fact stands that we buy the comic to see him face off against Green Goblin or Venom. This is doubly true for G.I. Joe comics. If we wanted relationships to the central focus of our comics, we'd be reading Archie instead. Will Rosado's art is one of the few saving graces is this book. Last issue looked somewhat sloppy and rushed. This was a return to his more usual style. I'm not always in impressed with how he draws women (Scarlett in particular), as they sometimes come of a little masculine. But considering these are military/para-military women, that might be the intention. I have to admit, using a flash mob as a weapon against the Joes was a bit ingenious. I was apprehensive about this storyline when it began three issues ago, and every subsequent issue has left me even more disappointed. This is an entirely skippable issue. Pass. Good review. Can't agree with you on Rosado's art, though. I respect what he does but don't care for his style.